Root canals are performed on teeth that are infected or have a significant amount of decay. The procedure is done to remove the infected nerves and pulp so that the tooth can be restored rather than removed. People are often nervous before their first root canals, but the procedure is much easier than you may think. Here is a look at what to expect if your dentist recommends that you have a root canal. In reality, you could have a root canal without anesthesia, because the nerve is dead and can’t cause pain. Nonetheless, your dentist will provide local anesthesia to numb the area. This is done to ensure you are completely comfortable and relaxed for the procedure. 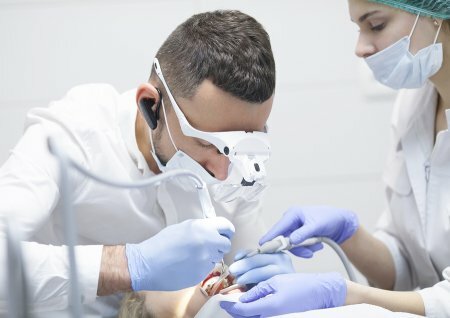 You will also have an x-ray in preparation of the root canal and anesthesia so that your dentist can determine exactly where you need to be numb and to look for signs of infection on the bone. Once you are numb, your dentist will place a rubber dam around your tooth to keep the area dry and then drill an access hole in the top of the tooth. Using a series of files, your dentist will remove all of the bacteria and decayed tissue . Once the tooth is cleaned, the dentist will seal the root canals and close the access hole with a filling, unless he or she wants to put medication into the tooth. If medication is placed inside the tooth, you will receive a temporary filling while the medication works. After a week, the temporary filling will be removed and the tooth will be sealed. A crown can be placed over the tooth after a root canal is complete. The crown is used to make the tooth look uniform with the rest of your smile and to ensure it functions properly. A crown can be placed at the same appointment, or your dentist may have you come back for the crown at a later visit. Glenwood Premier Dental performs root canals in Hazlet in our office, giving patients the convenience of having all of their dental care done in a single location. Contact us today at (732) 264-4477 to make an appointment.